Every photographer has their local "go-to" spot that they can hop in the car /jump on their bike and get to in 5 minutes to blow off some steam with shutter therapy after a long day in front of the computer. 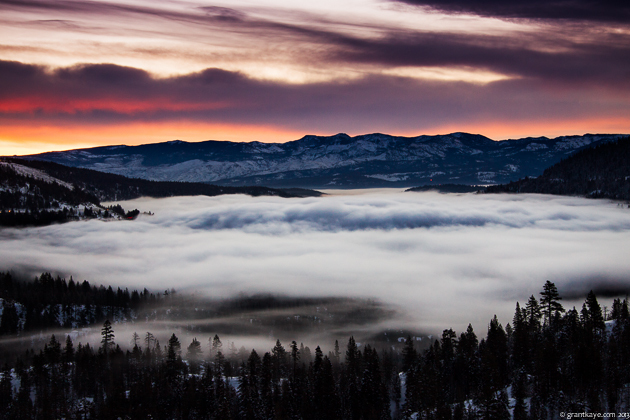 Mine is Donner Lake, located right here in Truckee, California. Even though it is 90% surrounded by houses, Donner Lake is remarkably beautiful to photograph if you work hard to find the right angles and the conditions converge to bring good light. Sometimes the lake even freezes over to the point where people drag couches out onto it and play hockey. The lake has even been known to have it's own sailing stones, like those on the Racetrack Playa in Death Valley. Sign up with your email address to receive news and updates about future class offerings and tips on how to have more fun with a camera. Life is short, go on an adventure!